During the Renaissance musical composition flourished, but it was a time of great change, fuelled by religious division. 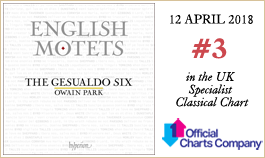 This record explores music written by some of the English Renaissance masters over a period of two hundred years, encompassing florid, medieval-sounding works by Dunstaple and Cornysh, intricately woven polyphonic works by Tallis and Sheppard, and the beautiful simplicity of Tomkins and White. All of these composers were obliged to write in the musical style of the moment, which was constantly fluctuating in one of the most turbulent periods in English history. Lavish Catholic services required suitably elaborate music, with Latin texts and rich sonorities. The Protestants did away with such excess, and as the walls were whitewashed so too was the music, with demands placed on composers to set English words as simply as possible, so that every syllable could be clearly heard by the congregation. Then, in Queen Elizabeth I’s reign, came a kind of relaxed simplicity, a halfway house, in which the ideal was both that the words could be heard clearly and also that the music should be interesting. The enormous contribution to this period by Thomas Tallis and William Byrd is represented by the inclusion of three works from each composer, showcasing the versatility of their writing. While all composers in Tudor England were flexible to the period’s shifting religious requirements, none was quite as skilful at reinvention as Tallis, whose music remains absolutely consistent in its quality, even while his style changes dramatically. The recusant Byrd gave voice to the plight of Catholics in England through many of his compositions, using his royal favour to escape punishment for his beliefs, and in doing so wrote some of the most enduring and powerful music of the era. The presented order is not a linear journey, but a grouping akin to a concert programme, where balances of fast and slow, similarity and contrast are brought into play. 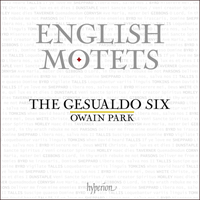 The incredible productivity of composers writing during this period, coupled with the advent of printed sheet music and licenses granted for its production, has resulted in a wealth of material available to us—and, as such, selecting only a handful to represent ‘English motets’ as a whole was by no means easy. But I hope that we have managed to showcase something of the extraordinary journey which composition took around the English Reformation and, in turn, reflect our immense enjoyment in performing the music we all grew up singing. John Dunstaple’s isorhythmic motet—a form built around a repeating rhythmic pattern in one part (in this case the tenor)—combines three different texts, including the hymn Veni creator Spiritus and the sequence Veni Sancte Spiritus, to create a densely packed polyphonic work. Generally, the motet’s three upper parts act quite independently from the more static lower voice, though there are a few moments of excitement when the parts seem to come together in dialogue, notably when the falling phrase in the top part at ‘O lux’ is briefly taken up by the two inner voices. Short duet passages, mostly between the two highest voices, consistently cede to the four-voice texture, with lively and florid gestures in the vocal lines throughout. Ave Maria, mater Dei is one of eight works ascribed to ‘Cornysh’ in the Eton Choirbook, the era-defining collection of 93 pieces compiled between 1490 and 1502. It was supposed that William Cornysh the Younger composed the work, but more recent scholarship has pointed to his father’s authorship, though the name was taken by three musicians at the time. One of the few surviving music manuscripts from the reign of King Henry VII, the Choirbook is dominated by Marian works, though Cornysh’s setting is without a known liturgical function. The text extols the virtues of Mary, asking her to guide all Christian people to serve her will. The first half of the work is characterized by twisting melismatic lines, with particular emphasis given to ‘domina’ and ‘inferni’. More syllabic phrases follow in the second half, quickening the pace and intensifying the mood with short motivic cells, which are developed briefly before being swiftly dispatched in favour of a new idea. Probably written during his last few years, John Taverner’s Quemadmodum reflects the move away from the florid pre-Reformation techniques used in older Tudor compositions (heard here in works by Dunstaple and Cornysh), to a pared-back style more influenced by Continental composers. Whilst Taverner’s setting survives only in instrumental form, its origins are clearly as a vocal work; it is wonderfully refined in its use of imitation and its seamless manipulation of the polyphonic texture—the six parts spinning out long melismatic lines. Sequences of suspensions shift the harmonic foundations skilfully, while individual phrases are highlighted by imitation between the parts, such as the ‘ad te, Deus’ at the end of the first part: a glorious series of suspensions where the tension is released through descending melismas. John Sheppard’s two settings of Libera nos, salva nos were probably written during his tenure as Informator Choristarum at Madgalen College, Oxford, where the statues decreed that this text be recited twice a day. Unusually, the first setting places its anchoring cantus firmus in the lowest voice part, weaving lengthy melismatic phrases above it in the upper voices. A slow harmonic pulse and the endless cycles of tension and release created by the close-knit vocal lines give the music a sense of constant movement—of unfolding, seemingly spontaneously, before our eyes. Only at the end are the top voices allowed to break free from this pattern and from their controlled tessitura and sing a glorious high D in their closing gesture. Sheppard’s second setting of this text, and its heartfelt prayer for salvation from the blessed Trinity, is a little shorter than the first. Shorter melismas and fewer internal repetitions give the text more clarity and urgency, reminding us that this is an intercession whose pleas have not yet been answered. ‘O beata Trinitas’ stands apart for its lovely, descending contour, and a doubling of note values here stretches each of the yearning phrases to its limit, both delaying and intensifying the music’s inexorable conclusion. The brief reign of Queen Mary I saw a return to the lavish Catholic services worshipping the Virgin Mary, in all their musical splendour. Together with his contemporaries, Thomas Tallis adapted swiftly to the new regime, producing rich, polyphonic anthems to feed to the new liturgical demand. Although its exact date of composition is uncertain, it seems likely that Pentecost responsory Loquebantur variis linguis was produced during this period. As with most polyphonic responsories by Tallis, the anthem’s cantus firmus (heard in the ‘tenor’ line) provides the material developed and imitated in the surrounding voices in music that offers a thrilling and dramatic representation of the disciples speaking ‘in many languages’. Taking pride of place in the first publication of Tallis and Byrd’s Cantiones Sacrae in 1575 is the magnificent anthem Suscipe quaeso Domine—a work once thought to date from the 1550s, but whose position in a collection dedicated to Elizabeth I would seem to place its composition rather later. After a striking opening, in which the music grows from just two voices through to the complete seven-voice texture, Tallis begins to manipulate and vary his scoring to emphasize key points in the text. The reduced forces of ‘Dele culpas meas’ (‘Do away with my crimes’) mark the start of a slow build-up to the end of the first section, sustained through repetitions of a wonderful arch-shaped phrase on ‘gratia tua’ (‘by your grace’), coloured by false relations and the joining together of voices in twos and threes. The second part unfolds and expands in a similar way to the first, but this time the full texture is delayed until the final iteration of ‘quis sustineat?’ (‘who could bear it?’). The music that follows is more antiphonal, setting higher and lower voices in opposition. Quite unexpectedly, Tallis halts proceedings prior to the homophonic statement of ‘Nullus est enim mundus’ (‘For there is no one who is clean’), before bringing the work to a lulling close with pairs of cascading thirds set against slower rising motifs. Intelligibility of text is all in If ye love me—a work whose simplicity couldn’t be further from the rich and involved counterpoint of Loquebantur, and one whose guiding principle seems to be Archbishop Cranmer’s edict that sacred music should use only one note per syllable. Tallis opens the work with a clear declamation of the text, emphasizing the word ‘commandments’ and leaving his listener in no doubt of the importance placed on learning and teaching in the new language of the Church. Despite continuing in a four-part polyphonic texture, none of the clarity of text is lost, with beautiful descending phrases passed around the voices. Robert Parsons’ career spanned the reign of three English monarchs, and for the last nine years of his life he was a Gentleman of the Chapel Royal. In Deliver me from mine enemies, Parsons skilfully sets words from Psalms 59 and 60, introducing a new musical idea for each new line of text. This is declamatory, largely syllabic music, and melismas are reserved for special effect—to heighten or intensify impact, as with the climactic pronouncements of ‘against me’ and ‘blood-thirsty men’ in the Contratenor Decani (Tenor I) part. In a masterpiece of structural ingenuity, the two upper voices work together in strict canon throughout, with close imitation of the thematic material also sustained in the other parts. Robert White (whose short but successful career took him to Trinity College, Cambridge, Ely Cathedral and Westminster Abbey) composed four settings of the Lenten Compline hymn Christe, qui lux es et dies, all based on the traditional chant melody. This, his first, is an understated exercise in textural contrast, alternating single-voice chant with a five-voice chordal texture. Subtle changes in harmony gently colour each verse of the text, but the voices remain homophonic throughout, with only one instance of a voice moving separately from the rest—in the middle polyphonic verse, at the end of the important phrase ‘Cor ad te semper vigilet’ (‘Keep our hearts forever awake to you’). The penitential motet Miserere mei, Deus is the final piece in the five-voice section of the 1591 Cantiones Sacrae. The musical texture fluctuates between homophonic cries for God’s mercy and weaving polyphonic lines. The music dwells obsessively on the words ‘dele iniquitatem meam’ (‘do away with my wrong-doing’), an impassioned plea that eventually subsides with a delicate juxtaposition of major and minor thirds. Ne irascaris, Domine was published in the Cantiones Sacrae of 1589, while Byrd was still a member of the Royal Household Chapel and under the patronage of the publicly Protestant (whatever her private devotions may have been) Queen Elizabeth I. Here, he carefully selects a biblical text which laments the destruction of Jerusalem, inviting a parallel with the fate of the Catholic Church in England. The atmosphere is one of quiet, resigned contemplation; a pair of trio passages gradually opens out into the full vocal texture. Byrd initially limits the range of the upper voice to a fourth, as though trying to contain and restrain the grief that bubbles just beneath the musical surface. At last, after ‘Ecce’, it is allowed to roam more freely—a release the music seizes in some of the composer’s most tender and lovely writing. The mood is sustained into the second part, ‘Civitas sancti tui’, whose mourning is arrested by the poignant silence that divides the final section—the heartbreakingly beautiful repetitions of ‘Sion deserta facta est’ (‘Zion is a wilderness’), whose descending contour seems to sigh and droop even as the harmony offers a tentative promise of salvation. A pupil of William Byrd, Thomas Morley held posts at the cathedrals of Norwich and St Paul’s before becoming a Gentleman of the Chapel Royal in 1592. After his master had left London for rural Essex, Morley was granted the monopoly on music printing in England, and soon published numerous volumes of madrigals and canzonets. The influence of the madrigal can clearly be felt in the composer’s Haec dies, whose lively imitative and scalic writing treats the sacred text with the secular playfulness also evident in Byrd’s setting of the same text. Morley’s piece begins homophonically, before breaking down into a musical game of tag, with the lowest voice running to catch up with the upper voice. This game is taken even further in the ‘Alleluia’, where the parts constantly fluctuate between declaiming the text together and imitating one another while following close on each other’s heels. Probably composed as a lament for Henry, the young Prince of Wales who died in 1612, Thomas Tomkins’ When David heard was later published by the composer in a set of madrigals, though it was still sung in religious services. Composed in two sections, the anthem’s power lies in its unexpected shift from third-person description to a first-person outpouring of grief—suddenly and shockingly intimate. The first section describes King David overcome with grief at the loss of his son, Absalom. Tomkins repeats key words with their musical figures to great effect, focusing on short-term interplay between the parts rather than extended polyphonic lines. The second, longer section puts words directly into the anguished father’s mouth. The music gradually becomes more charged: the tessitura rises, the vocal texture thickens and the music convulses with funereal rhythms and heartbreaking chromatic melodies. As the work begins to subside, there are two beautiful arrival points—the first on the dominant, and the last on the major tonic, perhaps indicating the possibility of cathartic release on the other side of pain. Straddling the late Tudor and early Jacobean periods, in many ways Orlando Gibbons provides the compositional link between William Byrd and Henry Purcell. O Lord, in thy wrath rebuke me not shares its opening with the composer’s Fantasia a 6 No 5 for viols, but the magic here is in the shifting textures employed to bring the text to life. Gibbons deliberately reduces the forces to highlight two major points in the text: ‘for I am weak’ is sung only by the upper three voices, and the exclusion of highest voice for ‘My soul is also sore troubled’ then intensifies the following cry of ‘but, Lord, how long wilt thou punish me?’, which itself contains the work’s most surprising, but ultimately most delicious chord.